"Demers has done a good job of giving this book as much user appeal as is feasible ... informative ... for those relying on it to help them with their research ... interesting ... of interest to beginning graduate students ... (and) to researchers in other fields ... ."
When it comes to comprehensive coverage of U.S. media history, theory, law and the Internet, you can’t find a better dictionary! The Dictionary of Mass Communication & Media Research provides readable, easy-to-understand definitions of more than 2,500 terms and concepts associated with (1) the seven traditional mass media (books, newspapers, magazines, motion pictures, recording industry, radio and television); (2) new media and the Internet; (3) history of mass media; (4) media law and media ethics; (5) media research methods and statistics; (6) advertising and public relations; (7) global mass communication and global media companies; (8) major media theories; and (9) prominent media professionals and scholars. 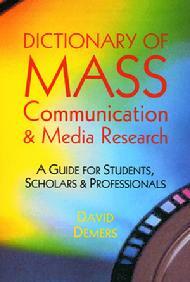 This book is a great resource for graduate courses on media research and theory. David Demers is author or editor of 12 books, including Global Media: Menace or Messiah? (Hampton Press, 2002) and The Menace of the Corporate Newspaper: Fact or Fiction? (Iowa State University Press, 1996).